A man who has attained success as a higher education administrator is forever grateful to mentors who guided him as he was learning his craft. Jeffery Elwell, who received his Ph.D. in theater from SIU in 1986, has served multiple universities in key leadership positions. Elwell says his two-year stint at SIU, where he developed playwriting and theater production skills, was particularly critical in his life. 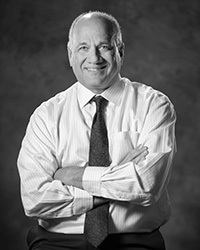 Elwell assumed his current role as dean of the College of Arts and Sciences at the University of Tennessee at Chattanooga in 2012. Previously, Elwell was Provost at Auburn University at Montgomery, and dean of fine arts and communication at East Carolina University. He has also directed theater and arts programs at Marshall University, University of Nebraska at Lincoln, Mississippi State University, Aurora University and Gardner-Webb University. An accomplished playwright, Elwell has written, directed and produced more than 50 plays. His work has been featured in New York, Los Angeles and Chicago, the country’s three largest markets. He attributes his success to two mentors including the late Alred Straumanis, his dissertation chair at SIU, and Ronald C. Kern, retired chair of the theater department at the University of Louisiana at Lafayette, where Elwell attained his master’s degree. Some 30 years later, Elwell is paying tribute to his mentors. He and his wife, Edwina, recently bequest funds to the Ronald C. Kern–Alfred Straumanis Scholarship, an honor that will be bestowed on a SIU theater student pursuing a career in playwriting. The couple originally created the scholarship to honor the mentorship Elwell received from both men. Elwell maintained a relationship with Straumanis until his death. He continues communication with Kern. “Both gentlemen had an extraordinary impact and helped make me,” Elwell says. “They encouraged me as a playwright and tested me through a great deal of time and effort. They both had tough exteriors, but were approachable with great hearts. Jeffery Elwell is grateful to SIU for another reason. He and Edwina, a 1983 business administration graduate, initially met on campus. The two met while Jeff awaited a doctoral loan check in financial aid, where Edwina served as an undergraduate student worker. A processing mix-up led to Jeff waiting an additional two hours for his check. Dylan Neudecker has been familiar with SIU for some time. A native of Centralia, just one hour north of Carbondale, he is a third-generation SIU student. His grandmother, LaDonne, earned an elementary education degree from the university in 1953. His father, Mike, is a 1988 electrical engineering graduate. Neudecker attended Saluki basketball games with his family as a youth. The SIU senior considered other universities, but a visit to campus for an Open House made his decision easier. “My father and I spent four hours with Lyle Kline, who was representing the mining engineering department at the event,” Neudecker says. “He took us on a tour of the department, computer and research labs and walked us around campus. I learned a lot about mining engineering that day. Mike Neudecker recalls the visit and was impressed with university officials. “They made it feel like home and Dylan fell in love with SIU,” he says. “He is an outgoing young man and has made the most of his experience. Dylan Neudecker is on track to graduate in May. As he reflects on his SIU experience, Neudecker doesn’t have any regrets. The Centralia native says SIU’s Mining Engineering Program – one of only 15 in the nation – prepares its students well for success after graduation. Neudecker says he has learned about the business side of engineering, studied various facets of surface and underground mining, in addition to rock mechanics and mineral processing. He is particularly grateful for hands-on learning opportunities that have complemented his classroom experience. Dylan Neudecker says scholarships and internships were valuable during his time as a SIU student. He has accepted a job with Lehigh Hanson, a global entity that presented him with experience in labor and management. Three internships have been beneficial to Neudecker. He spent two summers interning for Lehigh Hanson, a global entity that presented him with experience in labor and management. Neudecker has accepted a full-time job offer from the company. The department also provides learning experiences during Spring Break. 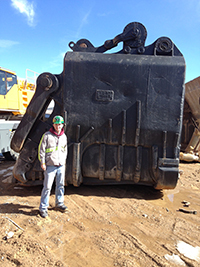 It facilitates trips for students like Neudecker to visit copper nickel mines in Canada. He is a member of the Society of Mining and Metallurgical Engineers, a national organization that offers learning and networking opportunities through a yearly conference. The SIU senior is currently an undergraduate research assistant for in the department. He values his SIU experience, which has been further enhanced through three scholarships. Neudecker has been received a monetary award from the Illinois Mining Institute and two scholarships from the mining engineering department. One of Neudecker’s jobs in school was working for his father, executive vice president and general manager at Engineered Fluid in Centralia. He served as an electrician and welder under his father’s guidance during his junior and senior years of college. Mike has seen this work ethic in his son since his youthful years. Dylan is thankful for his upbringing.